What is climate finance, and where does the money come from? What are key issues on climate finance in the international climate negotiations? How much does Germany spend on climate finance? How does Germany compare internationally? Which actors are involved in German climate finance? Does Germany have a climate finance strategy? Where can I find information on German climate finance? 1. What is climate finance, and where does the money come from? Climate finance refers to the financial support provided by industrialized countries to developing and newly industrialized countries for climate change mitigation, adaptation to the impacts of climate change, and the protection and afforestation of tropical forests (REDD+). In the UN Framework Convention on Climate Change (UNFCCC) of 1992, the industrialized countries pledged new and additional funds as climate finance for developing countries. It has not yet been determined how much each country should contribute to climate finance, however. Nor is there an international definition of what the individual countries can count as climate finance, or what constitutes “new and additional” finance. Climate finance has to date been drawn mainly from development cooperation, i.e. from public budgets. The practice for crediting such expenditures has not been standardized, however. Germany, for example, counts all projects identified by Rio markers as climate protection or adaptation measures toward climate finance. In the face of tight public budgets, the development of innovative sources of finance is being discussed intensively. Emissions trading and the Clean Development Mechanism (CDM) are not considered to be climate finance per se, as they regulate trading of allowances in order to achieve climate protection goals. They can, however, be an innovative source of funding. The most common example of this to date is the use of auction revenues for allowances from the EU emissions trading scheme (EU ETS), which Germany has used to finance the International Climate Initiative (ICI), and as of 2012, the special Energy and Climate Fund. However, this source only plays a minor role at present due to the collapse of emissions allowance prices. A second example is the levy of two percent on each transaction in the CDM that goes to the UN Adaptation Fund. Further proposals for innovative sources of financing include an tax on air traffic (bunker fuels) or the use of revenue from the financial transaction tax for climate financing. Both proposals have the support of civil society, but have not yet been implemented by policymakers. Private climate finance is also set to become increasingly important in future. The new Green Climate Fund (GCF), for example, features a special financing option for launching private initiatives. Governments see a major role for private finance in the expansion of climate finance as well. Little clarity exists over whether investments that were made as a result of publicly funded incentives are the only ones that should be credited toward climate finance, or whether investments without a public share also count. The extent to which public investment actually leverages private investment is subject to controversy. Civil society and experts seriously question the frequently cited, very high shares. Furthermore, private climate finance lacks transparency and leaves little opportunity to ensure the due diligence of the involved actors with regard to human rights, social and environmental standards. 2. What are key issues on climate finance in the international climate negotiations? Climate finance has developed into a central issues in international climate negotiations and is playing a key role for the realization of a new agreement at the upcoming climate change conference in Paris (COP 21). One of the most important issues is the implementation of the financial commitment made by the industrialized countries at the climate conference in Copenhagen of 2009. At the time, the industrialized countries pledged $100 billion a year for mitigation and adaptation measures in developing and newly industrialized countries from 2020. The work program on long-term finance (LTF) of the United Nations Framework Convention on Climate Change (UNFCCC) is thus focused on the question of how climate finance can be gradually increased to reach $100 billion by then. At present, the industrialized countries have only had to report on their progress in climate finance every two years. Despite numerous initiatives (such as the background study on long-term financing commissioned by the German government in 2015) and demands by developing countries and civil society, the industrialized countries have still not submitted a roadmap for the expansion of climate finance by 2020. Likewise, it is not clear how and to what extent private climate finance should be taken into account. Right before the Paris COP, the OECD launched its report in order to demonstrate that developed countries are well on track towards meeting their promise. The report, however, met with some criticism. In Paris neither a roadmap for the $100-billion pledge was adopted nor a concrete target for the distribution of climate finance between mitigation and adaptation in order to tackle the lack of sufficient funding for adaptation. Overall the Paris deal is very weak when it comes to climate finance. It does not contain any binding agreement on scaling up climate finance or an explicit requirement to all governments to reduce their support for international fossil fuel investments (more). In addition, the establishment of the Green Climate Fund (GCF) is a key issue for the future of international climate finance. While the GCF Board spent the years 2013 to 2015 concentrating on working out the details, the first round of financial pledges to the fund nearly reached the target of $750 million at the end of 2014. The first projects and programs to be financed by the GCF were selected by the end of 2015. In 2016 the GCF Board is focussing on the elaboration of rules and procedures to guide the operationalization of the GCF (more). 3. How much does Germany spend on climate finance? Germany increased its climate finance from €471 million in 2005 to just over €2 billion in 2013. Furthermore, Chancellor Merkel promised a doubling of climate finance to €4 billion by 2020 in the summer of 2015. This is a step in the right direction, even though Germany’s share of the $100 billion pledge is generally considered to be ten percent (i.e. $10 billion or €7-8 billion) based on the country’s relative economic performance. 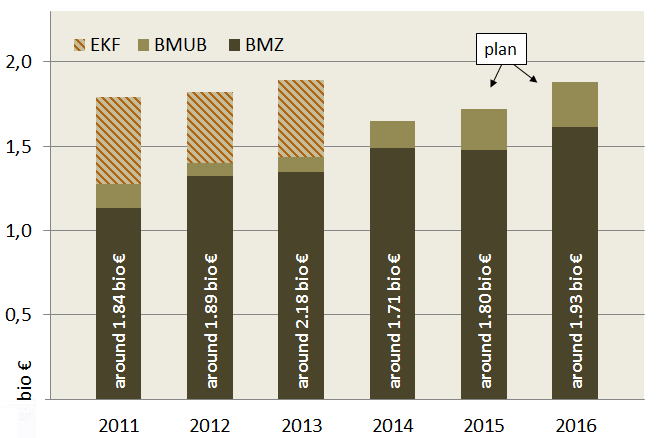 The figures illustrate climate finance from the section of the Federal Ministry for the Environment, Nature Conservation, Building and Nuclear Safety (BMUB), the Federal Ministry for Economic Cooperation and Development (BMZ) as well as the Energy and Climate Fund (EKF), the latter as financial commitments (figure 1) and as disbursements (figure 2). Source: own compilation based on German government 2013-2015. Figure 1 corresponds to the OECD standard. It illustrates the significant financial commitments made through the Energy and Climate Fund (EKF) in the years 2011-2013. Figure 2 illustrates the accounting method of the German government. 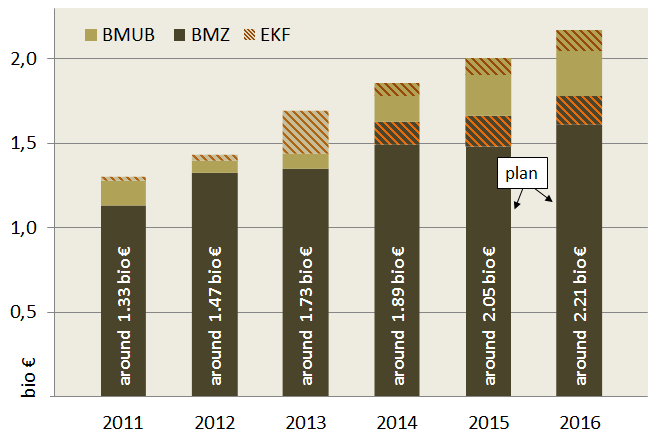 The financial commitments from the EKF in the years 2011-2013 only appear as disbursements from 2013 onwards. This delayed accounting implies a continuous increase of German climate finance, while in fact the overall volume available for bilateral financial commitments has stagnated. In 2014, the German government put a total of €1.67 billion into bilateral climate finance for developing countries. A further €233 million were paid to multilateral climate funds. 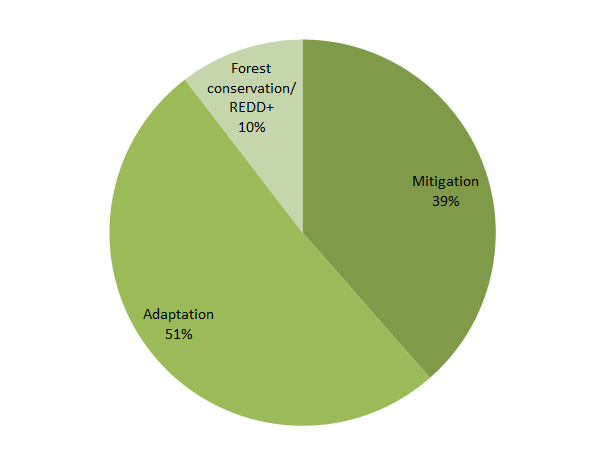 Of the bilateral funds, 39 percent of climate finance was pledged toward mitigation. A further 10 percent benefited the forest conservation/REDD+ sector, while roughly half of the funds went to adaptation projects. The regional breakdown shows that 26 percent of the funds went to sub-Saharan Africa. At 16 percent, the Middle East and North Africa (MENA) received as large a share as Asia (16 percent) and Central and South America (17 percent). 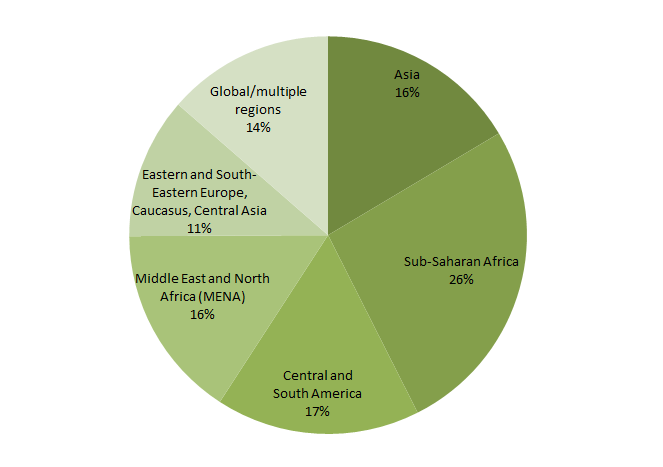 Approximately 14 percent of the funds were used for global or multilateral projects. An analysis of Germany’s Fast Start Finance performance from 2010 to 2012 – another pledge from the Copenhagen climate summit in 2009 – can be found here. Further overviews of German climate finance since 2008 based on the information contained in the project database can be found in the infographics. 4. How does Germany compare internationally? Internationally, Germany is one of the largest donors in climate finance. 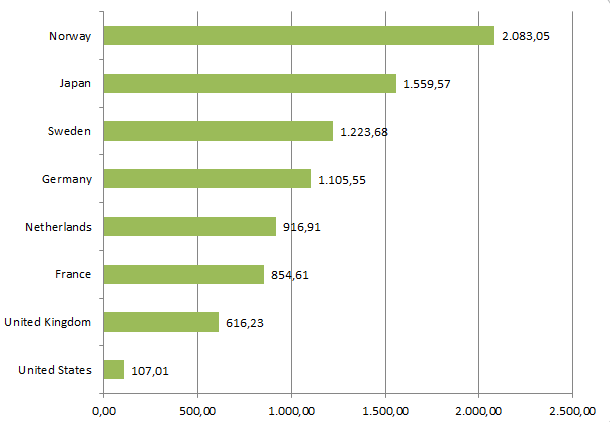 In absolute terms, with its €2 billion in 2013, Germany was in second place behind Japan. When putting finance commitments in relation to gross domestic product (GDP), however, Germany slips to fourth place behind Norway, Japan and Sweden. Furthermore, the OECD states that the share of projects financed by Germany that have mitigation and adaptation as a primary and not merely a secondary objective is only 53 percent, while the shares for Japan and Norway are 76 and 68 percent, respectively. 5. Which actors are involved in German climate finance? Germany does not have a central body that manages its entire climate finance program. The lion’s share – around 90 percent – is administered by the Federal Ministry for Economic Cooperation and Development (BMZ) within the framework of bilateral and multilateral development cooperation. Its bilateral instruments include general financial and technical cooperation (FC and TC), the Initiative for Climate and Environmental Protection (IKLU) and funds that flow through non-governmental organizations. In addition, the BMZ manages a portion of the funds from the special Energy and Climate Fund (EKF). Implementation is mainly handled by the German Association for International Cooperation (GIZ) and the KfW development bank. Since 2008, the Federal Ministry for the Environment, Nature Conservation, Building and Nuclear Safety (BMUB) has also been managing a small share of climate finance resources to developing and newly industrialized countries. The International Climate Initiative (ICI) finances climate and biodiversity projects in developing, newly industrialized and transition countries. The BMUB also manages a portion of the funds from the special Energy and Climate Fund (EKF) processed by the ICI. 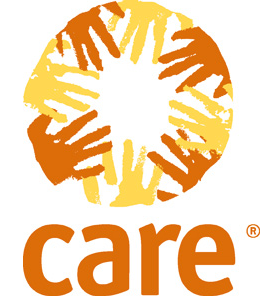 In addition to the GIZ and KfW, non-governmental organizations (NGOs), international organizations, research institutes and private companies also implement projects. Formally, the funds of the EKF belong to the Federal Ministry of Finance (BMF); the ministry is not involved in setting priorities for their deployment, however. 6. Does Germany have a climate finance strategy? The German government has not yet presented a coherent climate financing strategy as called for by civil society organizations. Such a strategy should define the government’s climate policy focus, the contributions of the various finance channels and the funding priorities in the areas of mitigation, adaptation and REDD+. Furthermore, it should credibly show how Germany intends to contribute its share to the $100 billion pledge of the industrialized countries. 7. Where can I find information on German climate finance? The German government publishes information on German climate finance broken down according to ministries. On its website, the Federal Ministry for Economic Cooperation and Development (BMZ) provides an overview of climate finance and a selection of publications on the topic. The BMZ archive also contains project lists for the years 2010 to 2012 containing all of the projects financed by the BMZ that are counted toward climate finance. More information on the funded projects can be found in part on the sites of the implementing organizations GIZ and KfW (in German only). The information, however, is spread across various sectors and not linked to the project lists. The International Climate Initiative (ICI) presents information on all of the projects it funds on its website. It includes a short presentation of the projects, information on the status of implementation, and in some cases links to further information. The site www.germanclimatefinance.de collects information on German climate finance and comments on the political processes. It also maintains a project database (in German only). In it, information on German climate finance is compiled from different sources on a project-specific basis and supplemented with analyses.